The biggest chocolate wrapper in the collection comes from a 4,5kg swiss chocolate Toblerone, almost the same weight (9 pounds) of chocolate wrappers reach two american chocolate wrappers Nestlé Crunch. The smallest chocolate wrappers in the collection are from chocolate napolitains which weigh often only about 3 grams! The oldest chocolate wrappers in the collection probably comes from the nineties of the nineteenth century. Among oldest chocolate wrappers belongs chocolate wrapper by french company Felix Potin and german chocolate wrapper Deutsche Schokolade by company Theodor Hildebrand. 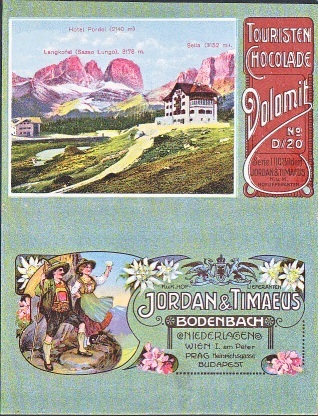 The oldest chocolate wrappers originating from the territory of the Czech Republic in the collection are Touristen Chocolade wrappers made by Jordan & Timaeus in Bodenbach (now Podmokly, part of town Děčín). On the cover are given depot in Prague, Vienna and Budapest, and the company used the title kuk court contractors. Northernmost chocolate factory in the world was Linda in Icelandic town of Akureyri, today, this brand of chocolate is produced in the town Gardabaer near Reykjavik. Southernmost place where chocolate is produced is in the Argentine city of Ushuaia on the southern coast of Tierra del Fuego, where there are several manufacturers of handmade chocolates, such as Laguna Negra. Since ancient times people have been collecting many different things. Some collecting interests like stamps, coins, banknotes or postcards have became mass popular. Collecting of many gastronomic items also started during twentieth century. It is difficult to say where and when first collections of chocolate wrappers were founded but probably it was in era between world wars in some european countries and in Usa. Golden ages of collecting chocolate wrappers started in 1960´s and 1970´s. I think there are some collectors of chocolate wrappers in every country where chocolate is widely popular - it means Europe, North America and large Latinoamerican countries + european culture influenced lands like Israel, South Africa, India, Australia or New Zealand. Most of first wrappers in all collections come from chocolates bought by collector himself or from friends. It is possible to write requests to chocolate companies but not every company will respond by sending some wrappers. There are also people who kept some wrappers in past or stopped with collecting so you can get some older wrappers by this way. The best method is exchange of wrappers with other collectors. I put most of my wrappers into transparent folios in files. I have now over 190 files full of chocolate wrappers. Chocolate wrappers that are too large or too small I keep in envelopes ( except extra large chocolate wrappers like Milka Millenium or 1kg wrapper by slovenian Gorenjka). All the wrappers are filled according to their country origin, then alphabetically in order of the producer. There are also other ways ( better or worse ) how to keep the collection. In the beginning of the chocolate collecting cutting fronts of wrappers was frequent way to minimalize storing room. Unfortunately there are still some collectors using this way how to damage the wrappers. Some collectors also attach the wrappers to papers. I think the best methods are keeping them in folios in files or keep them in envelopes. Many collectors also specialize in M & M´s or Smarties items. Very popular is collecting of figures and toys from Kinder Suprise chocolate eggs made by italian Ferrero. Since 1880´s when swiss Suchard first put collectible pictures to chocolate bars many companies have gone this way of advertising their products. These series of pictures also became target for collecting.